We started with cute "already ready for crafting with" bottle cap tops in a fun pink that we picked up at Michael's (They even had holes pre-drilled in them). You'll also need white glue, jump rings & lobster clasps, clear casting epoxy, and an assortment of papers and embellishments. A circle punch and some play dough is also helpful, but optional. First punch and glue circles of scrapbook paper into the bottom of your caps. Next, paint a couple thin layers of glue on the top of the paper to seal it and prevent the epoxy from soaking the paper. Follow the instructions that come with the epoxy and pour it into the caps. This is where the play dough comes in... the holes in the caps were pretty big which made for a huge mess when I poured the epoxy. About half way through I decided to try smooshing the caps down into a ball of play dough which kept them level while the epoxy dried but also plugged the holes. I'll admit though that idea didn't come to me until some epoxy had already seeped out of the caps I was working on, so I have as yet to test my play dough smooshing theory completely. If you don't have play dough, just only fill the caps to the bottom of the holes. Once your epoxy is completely dry, attach a jump ring and lobster clasp so your favorite off to school kiddo can clip it to their back pack or lunchbox or hoodie whatever strikes their fancy. One last bit of warning... The pull is only as strong as the jump ring you used to attach it with, so you may want to try an alternative to the jump ring... I considered a hair elastic, ribbon, jelly bracelet, or key ring. Now I want to see your way! 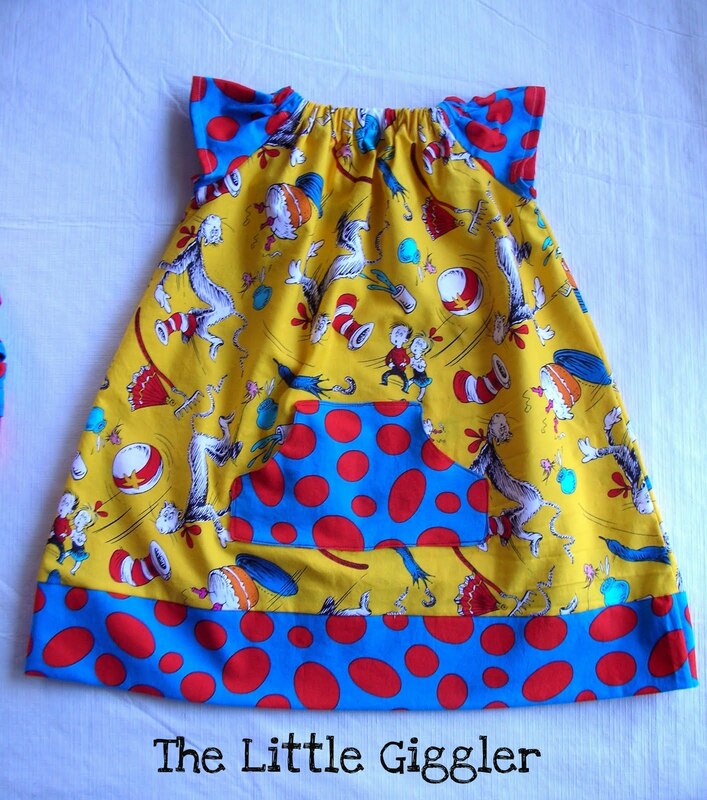 Did you see this adorable dress The Little Giggler linked up last week? This is the perfect way to do "branded/character" clothes... handmade from a super sweet pattern and paired with a fun print! The wonky dots are just so right for the whimsical Dr. Suess! Standing at the front door, pigtails pulled tight, brand new tennis shoes, and that “anxious about the first day of school” look is a photo op that just can’t be missed! Our oldest starts kindergarten this year and her little sister will be in tow for half days in the toddler program. Elle wore a shirt with her name on it for her first day of preschool last year and I thought I’d continue that tradition, so I spent a couple days considering various appliqué and embroidery designs for the shirts. When this idea came to me, I laughed out loud at the thought of how stinkin’ cute the two of them would be standing hand-in-hand wearing these T-shirts I made for them. I’ve never done iron-ons before & was surprised at how easy it is! I picked up a pack of the iron-on paper you can run through your ink-jet printer (I got the one designed for dark fabrics so that it would look like an actual sticker on the shirt) at Jo-Anns, designed the “Hello my name is” label in Illustrator, and then just followed the instructions for printing and ironing it on to the Ts. Think my girls will let me get away with antics like this every year for the first day of school? So what's a girl to do when she has a dessert table to design and needs a background that will make a statement but she set a limit of $100 for the party?! Crepe paper of course! Here's how easy it is. You just need 2 pieces of trim (they'll even cut it for you at Home Depot if you wonder around looking especially desperate in the trim aisle). I used a 4 ft table for the icecream sandwich bar, so I had them cut two pieces of trim - a 6 ft piece and a 4 ft piece. Once you cram the pieces of trim into your husband's Sonata and make it home, you'll tape lengths of crepe paper side-by-side in an orderly fashion all along the trim. If you're lucky enough to have a giant framed print hanging precisely where you want the crepe paper wall, you'll just use the hooks that you hung the print from to hold the pieces of trim. If you're not quite so lucky, you'll need to use 3M tape to attach the trim to the wall. Next I covered the table with a plastic tablecloth and strung a piece of clear packing tape between the bottom of the front two table legs sticky side out. Repeat the lengths of crepe paper taped side-by-side application on the 2nd piece of trim and attach it to the front of the table with 3M tape. Then twist twist stick to the packing tape, next piece just stick to the packing tape, twist twist stick, just stick etc. etc. etc. It's been entirely too long since I featured my favorite links from the weekly Your Way Wednesday posts I do. So, here you have it, my faves and this week's Your Way Wednesday link party. Don't forget to check out my Link Parties I <3 link on the right margin. If you host a link party please add it to the page, I'll link up! 1. 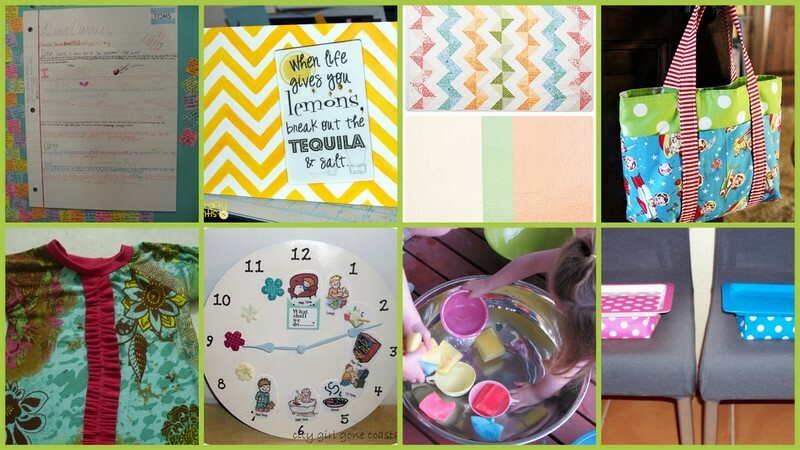 This "notebook paper" canvas is such a great idea for college students! 2. I, like everyone else, have a thing for chevron lately! This frame and super cute printable are perfect! 3. Did I mention my thing for chevrons? Check out this amazing zig zag quilt! 4. You just can't have too many kid size tote bags! 5. So love the fabric and fun ruffle detail of this peasant dress! 6. This routine clock is seriously genius for the little kid crowd! 7. Take advantage of the last couple weeks of summer to do these great ideas for summer time fun with your kiddos! 8. Okay okay this is my idea... yes that's sort of cheating, but I needed an even number for this lovely collage. Did you check out the toddler lapdesks I made from dollar store finds? 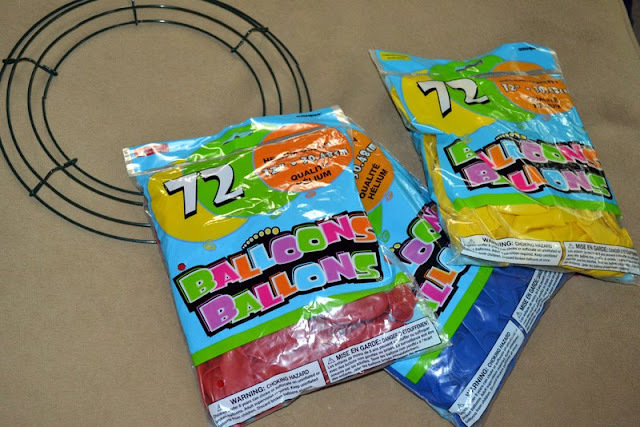 Yeah, so that's it... just tie the balloons onto the wreath form... the end. The only interesting things worth even mentioning are that I followed the same pattern (red, yellow, blue, repeat) and I skipped one of the wire rows that was close to the others... which I decided on just because the wreath was full enough without it and it was getting hard to tie the balloons on when they were too close to the other knots. 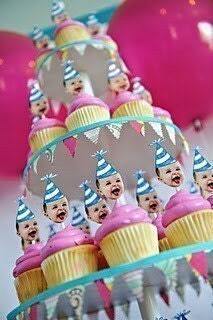 Oh and of course I should mention the adorable custom birthday hat cutie in the center... my Little Liv! I'll turn your birthday girl or boy into a party decoration too, check out the listing in my shop here. Simple Celebration - for under $100! I love planning elaborate celebrations centered around unique themes and pouring over every tiny detail. 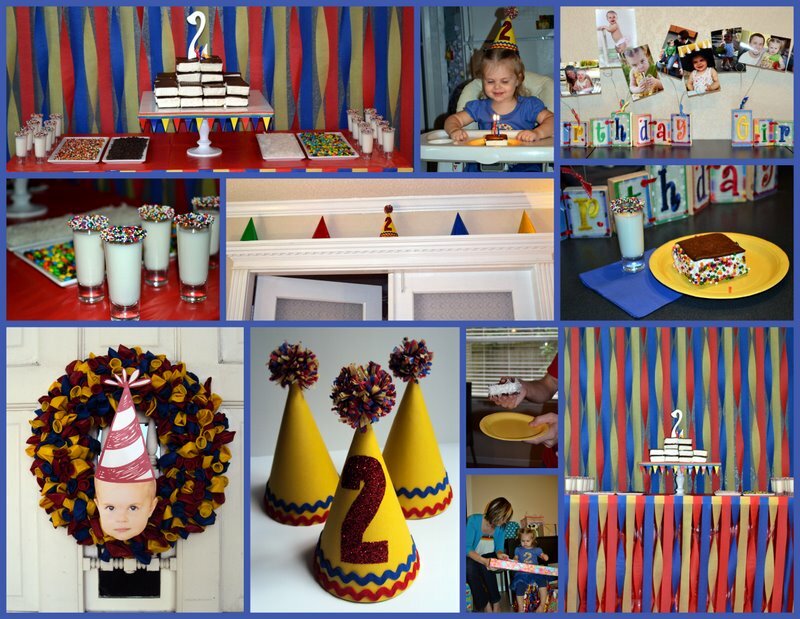 But for Liv's 2nd birthday I decided to go a different direction and see what I could pull off with relatively minimal planning, keeping it simple, and under $100. Yep, that's right... I did it all for just $94.66 to be exact! I started with a primary color pallet and committed to traditional birthday party fair like balloons, curling ribbon, party hats, bunting, and crepe paper streamers. 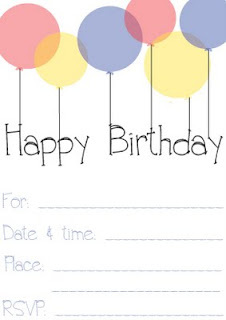 I designed the party invitation to be post card size, so I saved on postage, envelopes, and printing. 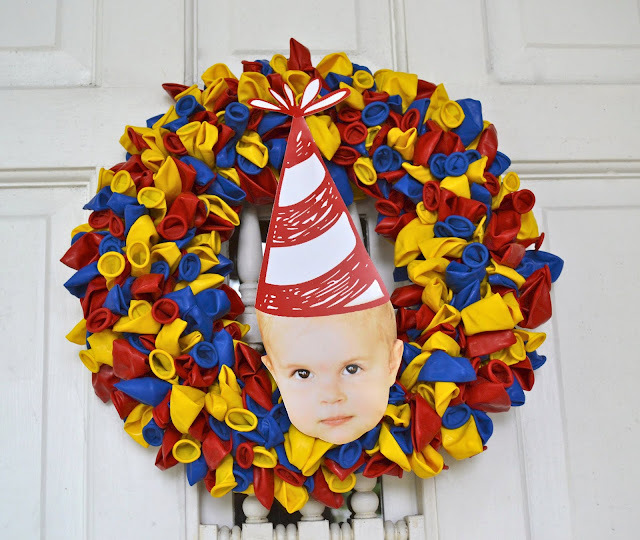 Guests were greeted at the front door with a balloon wreath and the birthday cutie's face. I thought this iteration of the custom cupcake picks I sell in my shop was so fun, I'm selling it in my Etsy shop now! The highlight of the party was the ice cream sandwich bar! 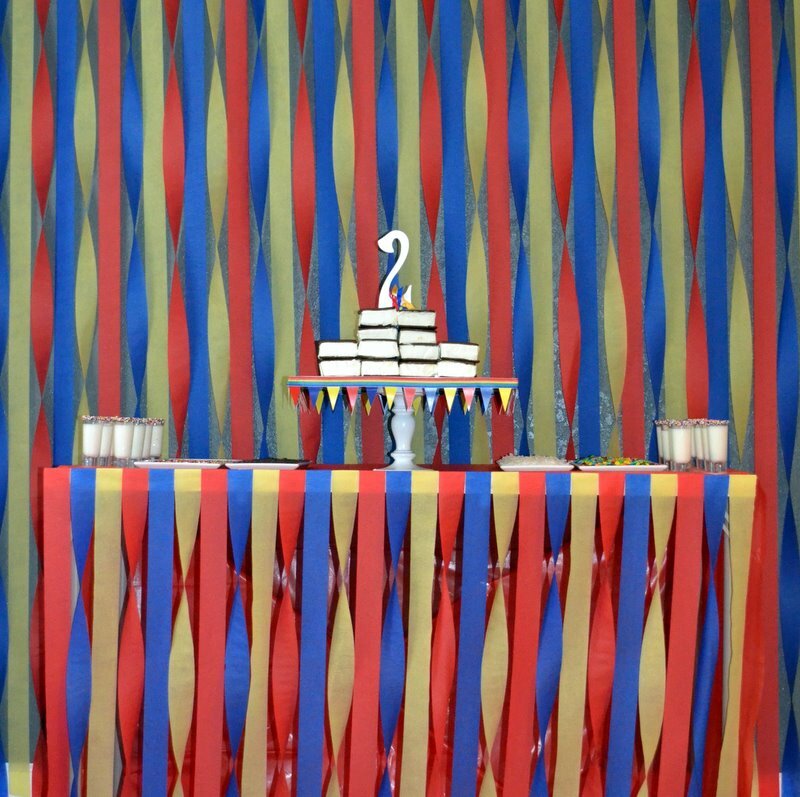 I set the stage with precisely hung crepe paper streamers on the wall and front of the table. Eight boxes of ice cream sandwiches I got on BOGO at my Publix were more than enough to make the two layer "cake" I stacked on the cake stand I made myself (have you ever purchased a birthday cake to feed 20+ for $19.56?!). A DIY "2" cake topper finished it off perfectly! Also on the table were four plates of toppings to roll the ice cream sandwiches in. We had mini M&Ms, mini chocolate chips, multicolor sprinkles, and coconut flakes. Last but not least, were the milk shots rimmed with chocolate syrup and multicolor nonpareills. All the details and "how to" for the backdrop, cake stand, and cake topper coming soon! Party hats are an easy project to make that really personalize the party. I made these from scrapbook paper, rick rack, and crepe paper pom-poms. The birthday girl got a special glittery 2 on hers of course! I also decorated a little stool for the birthday girl to sit on to open presents. Even though this party was a really traditional birthday theme, I always like to incorporate little touches that make the party unique to the guest of honor, this Birthday Girl photo stand showcasing pictures throughout the year did just that. So there you have it... a simple celebration that was creative, fun, and didn't break the bank! 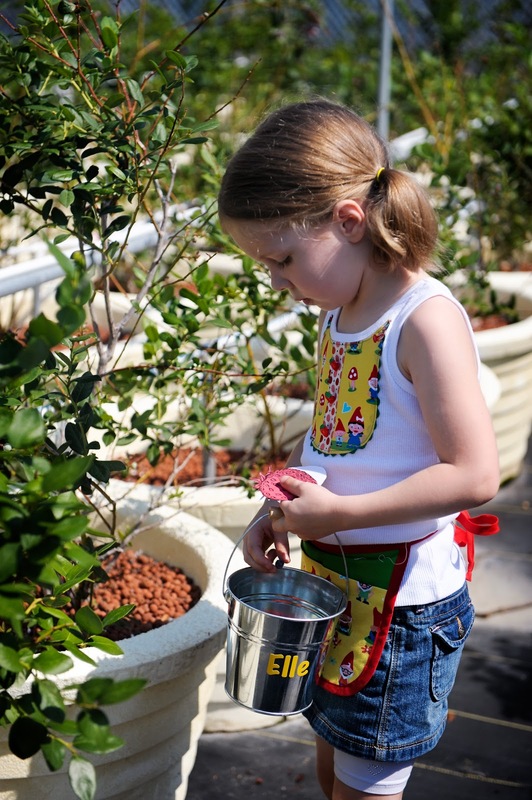 I made tons... ok not tons, just 15... of these gardening aprons for the party guests at Elle's U-Pick party. They were a hit with the kiddos and they looked so stinkin' cute wearing them as they wandered around the u-pick farm. I made a tutorial for you to make some for a little gardener you know. Start with two rectangles of fabric: the background fabric should be cut to 12"x8" and the main/pocket fabric piece should be 12"x11"
Press the pocket fabric in half long ways, wrong sides together and pin on top of the background fabric, lining up three raw edges. Sew two rows from the top edge of the pocket to the raw edge to create three pockets. Cut a piece of binding 28" long. Sew the binding around the apron, encasing three sidges of the apron, not including the top raw edge of the background fabric. Cut a piece of binding 50" long. Center the binding on the apron, and pin, encasing the top raw edge of the background fabric. Sew the binding to itself and then to the top of the apron then to itself again to make the ties for the apron and finish the top of it. Knot the end of each tie. I attached little name tags to the aprons with mini clothes pins and hung them on clothes lines strung across one end of the tent at the party. 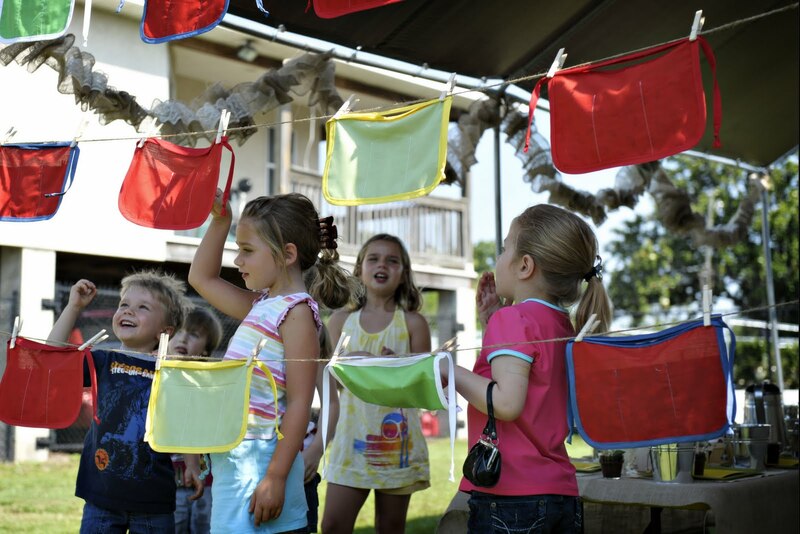 The kids loved finding their apron hanging up for them!